← Photos of the Water Festival in Phnom Penh. 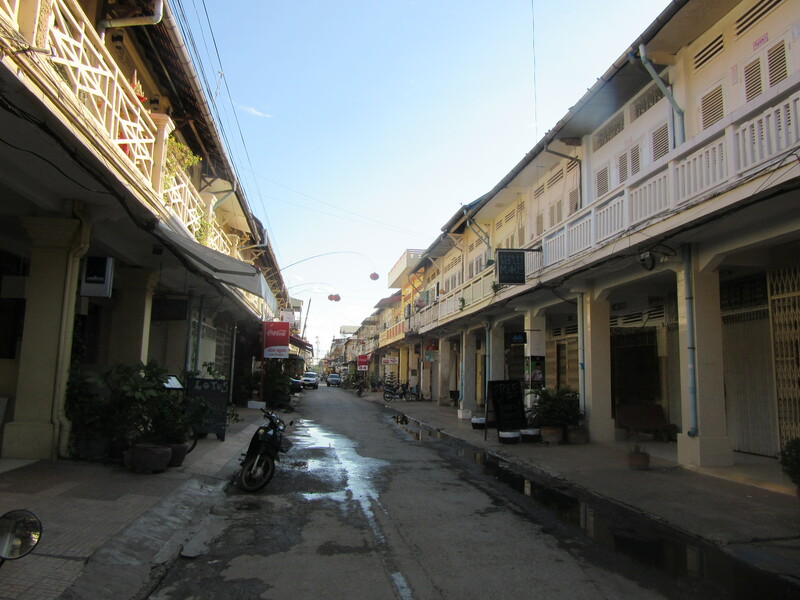 Battambang, and a kink in the road. Something went quite wrong for a little while. I was permitted to stay in my room in Phnom Penh with the great view of the river front but only for an extra day so rather then make do in a not so great a room for the rest of the Water Festival I jumped on a bus to Battambang. The bus ride was no great journey, maybe six hours, and at the bus station at my destination there was a tuk tuk driver with my name on a sign. This was something of a surprise as I had not booked a ride, but a pleasant one nonetheless, and I was happy to be transferred to the hotel for the princely sum of two dollars. My room was pleasant with a small shaded terrace in front but this is where things went slightly awry. I had a huge attack of lethargy. Just the thought of buying another ticket, waiting around for another bus, finding another hotel became overwhelming. I think I had what they call ‘hit the wall’. I was really quite miserable for a couple of days and was just a little concerned that maybe I was getting sick, malaria crossed my mind. The hotel was set a little ways out of town and I couldn’t even get up the get up and go to find a tuk tuk to chug the short distance to downtown. I have actually read that solo travelers get afflicted in this way after a while alone, but for the life of me I couldn’t remember the solution. Clearly this could not go on, so I texted my symptoms back to the family in far away San Anselmo and back came the solution, change hotels. Of course, palm to forehead. I moved. To a small villa run by a French couple from Paris, they have only owned it for six weeks and have a one year old and a four year old, Max, who goes to a Montessori School here in Battambang. Well, Montessori is not unknown to me (! 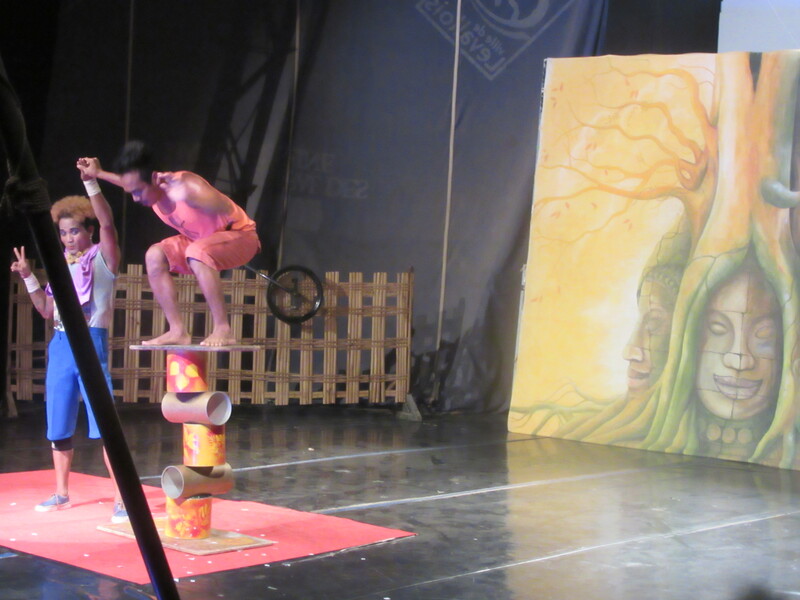 ), we chatted, they immediately organized a tuk tuk tour of the town for me and insisted I join their family that evening for a trip to the circus. Lethargy fled away. 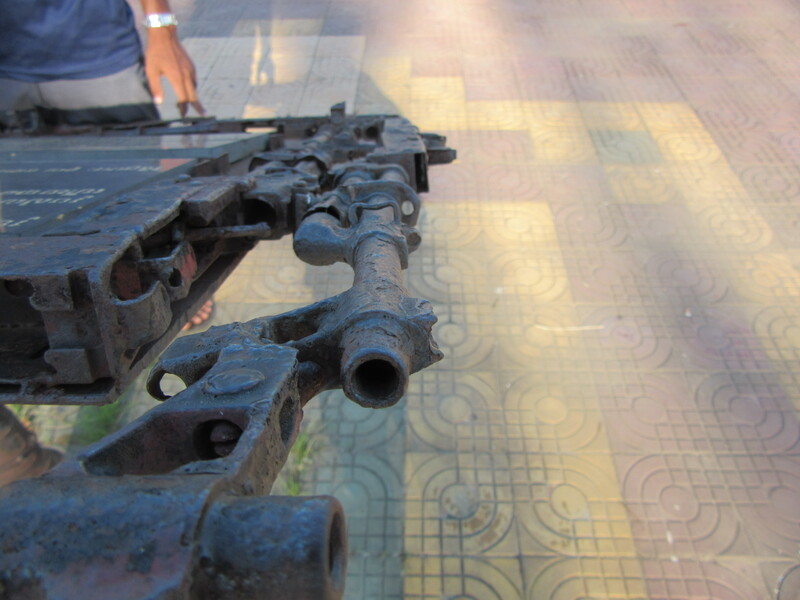 Off around the sleepy town in the tuk tuk I saw many interesting things, one of which was a statue made entirely of melted down AK 47s (guns) created after the madness, it was really quite moving. 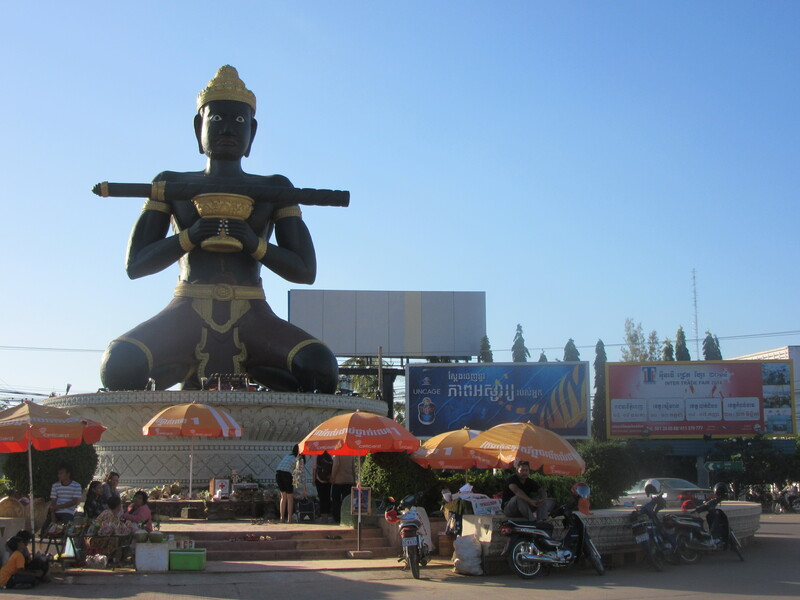 Another was the enormous statue of the town’s founder (Ta Dumbong) with his stick. 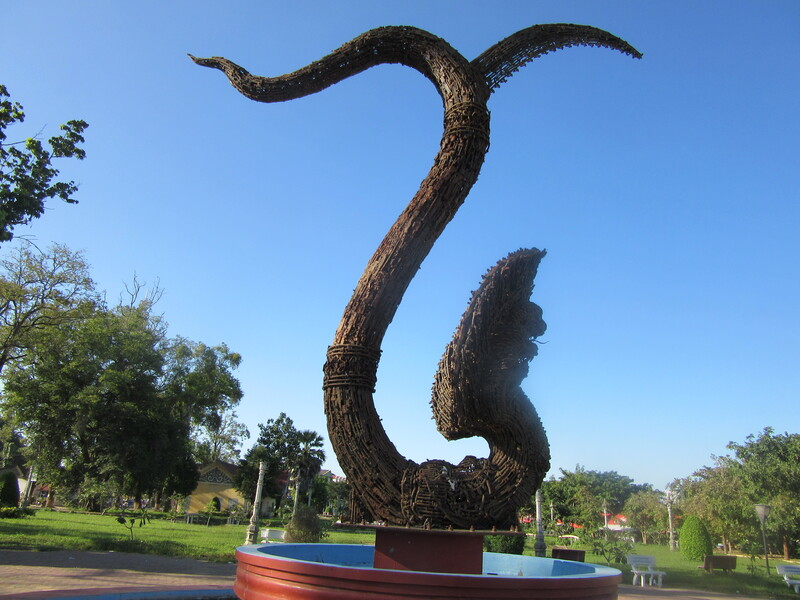 Battambang means “town of the lost stick”. It’s a great story but not worth going into here in any detail, just search for Battambang, lost stick and all will be revealed. I found some great restaurants, ate Western food a couple of times, walked the market, ambled through the streets admiring the colonial French architecture and generally threw off my funk. 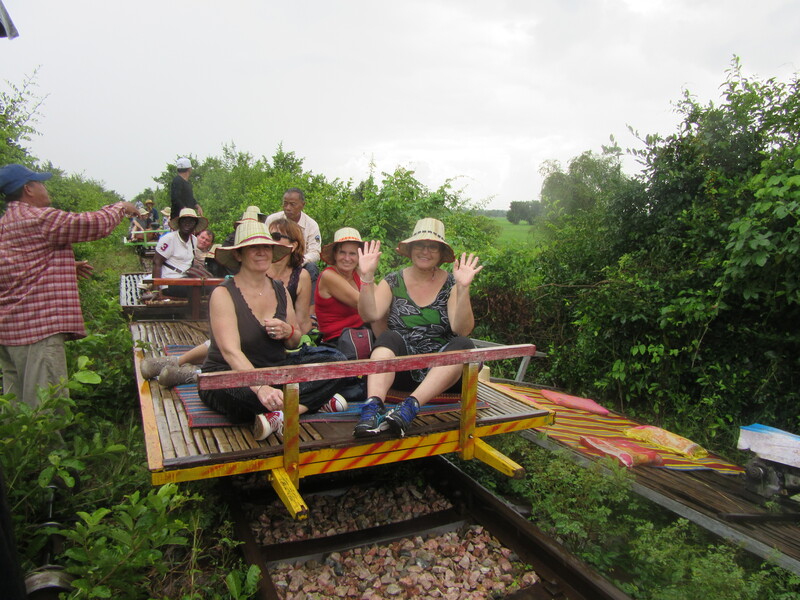 Those in touch using Social Media will have seen me on the bamboo train, very funny in the pouring rain. This train, if it can be called a train, was created by the French and partially resurrected after being destroyed by the mad men. The little carriages (norrie or norry) are basically bamboo poles, strung together, making a bed, powered by two stroke engines, very loud, they can achieve speeds of 30 MPH, they seat four and are a big tourist attraction. I remarked to my tuk tuk driver that the clouds were looking a bit black, oh no, says he, it will not rain. We arrived at the station, a collection of shacks, and had to shelter as there was a shower. 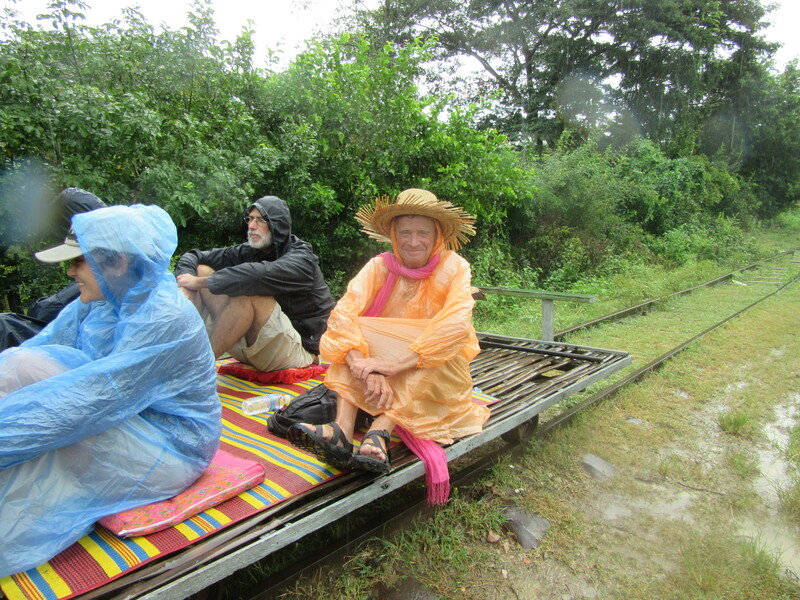 Climbing aboard we made our way down the track, the rain increased, a late monsoon, I got soaked and was on the verge of a sense of humor failure when we arrived at the turnaround. Dashing into a shack we found hats, ponchos, water for sale and everybody smiled. Off in the morning on the 7am boat, down the river, across the Tonle Sap Lake to Siem Reap. More tales of Angkor ahead. Not much doubt what it is made of. Ta Dombong and his stick. The Bamboo Railway. You can see our carriage, or norrie, in the background, on the ground. someone has to give way! The track ahead. About ten miles of it. 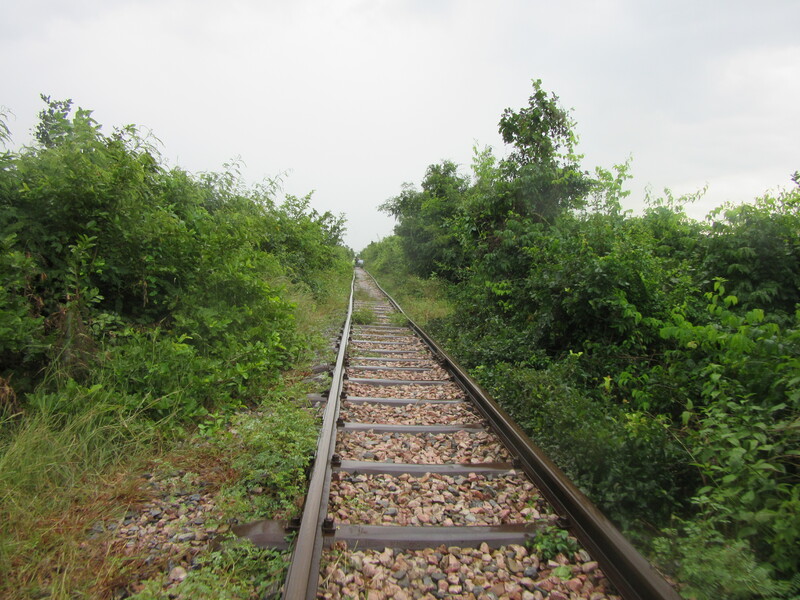 This entry was posted in Uncategorized and tagged Bamboo Railway, Battambang, Norrie, Norry. Bookmark the permalink. Glad you are back on track. You should have got some shoes from the market to coordinate with your poncho! Enjoy the next leg of your journey. Yes, back on track thanks, in fact it’s now a distant bad dream. Next leg of journey proceeding well despite 4.00am starts. 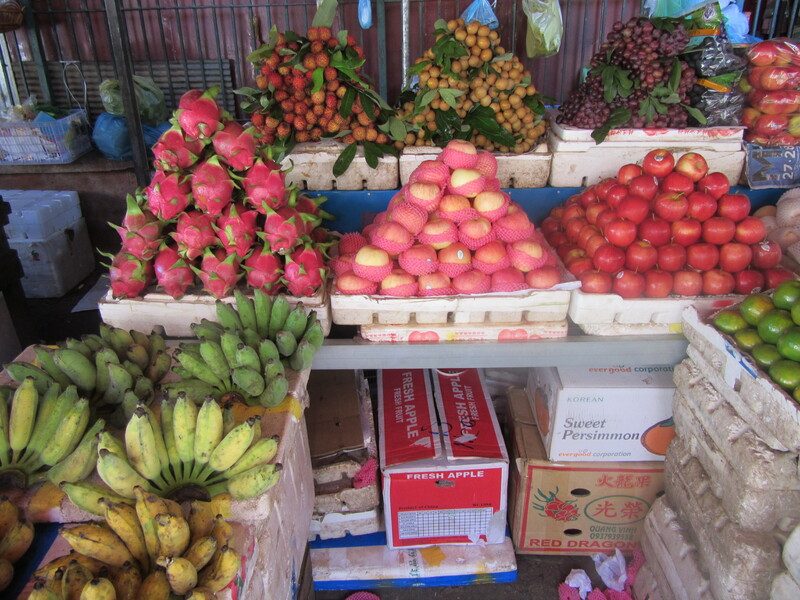 The Sangkar River, Siem Reap and Angkor Wat have all been outstanding. More in next post. 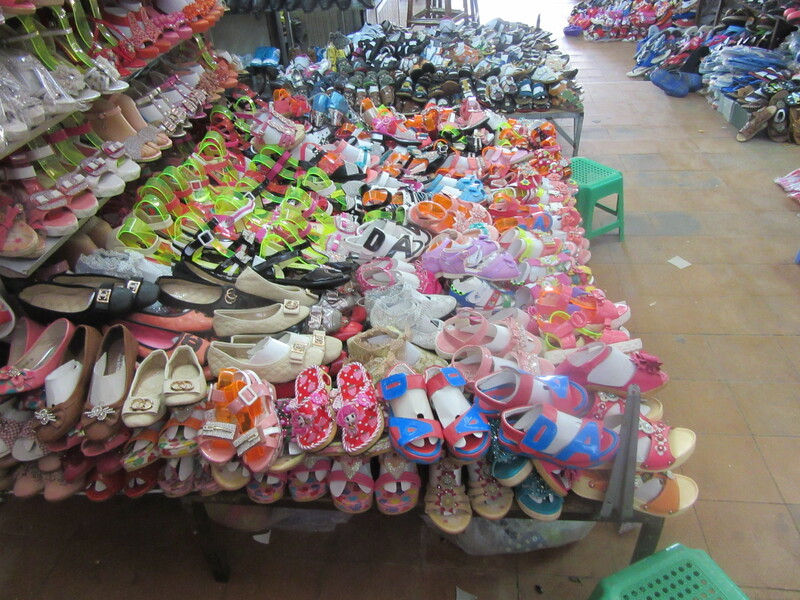 They didn’t have my shoe size! Sorry to hear about the kink. Hope you are feeling better. How about going to find your orphanage friends again? Yes, I have considered going to the orphanage but it does seem to be backtracking and anyway they tell me they are extremely busy. I may have to wait and see them again at their holiday villa on Elba. So sorry to hear you had the doldrums for a while – but I think that happens to all travellers, periodically, solo or not. Your days are a succession of ‘Wow’s, absorbing new experiences and sensations. There comes a point when the brain needs a break! As always, your photos are excellent, they really gives us a feel for where you are. Doldrums they most assuredly were, but shook it off and back to enthusiasm and excitement. I have to confess that the last blog post was a bit disjointed. I was scribbling away beside the little pool at the B and B when the owners invited me over to the bar to drink champagne. An Aussie girl had been staying with them for three months while she worked at the local hospital and was leaving the next day. Bloggers and champers don’t mix. Sorry. Lots of wows here in Siem Reap what with Angkor Wat on the doorstep. Thanks for staying the course with me. Still tracking you on Finding Friends, reading your blogs and checking out FB to keep connected. Trees are colorful here in MC and sprinkling of rain finally hit. Neighbors planted 2 new trees in their front yard, one turns red and the other turns yellow in the fall. Stay well. News from Ca. Happy to hear about the rain though I think we need lots and lots more. I tend not to put too much on f/b as you may have noticed, if people want to keep up with me they can read the blog and I don’t want to annoy everyone. But I have to say my recent couple of posts there on f/b seem to have well received. Fun to see who comments and from where. Trying to stay well, thanks.